When you store your party tent, you want to make sure that it is protected from dust and damage, but it can't take up too much room either. Easily store your tent canopy in this storage bag. This tent storage bag is made with sturdy vinyl and hemmed at the top with brass grommets and tie rope to securely close the bag. 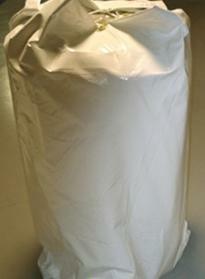 This tent bag has an approximate diameter of 6 feet and is designed to hold 20' x 30' and 20' x 40' tent sections.